The lurking problem at Toro Rosso has surfaced at last. And it seems that it's not the drivers after all, although Franz Tost, co-owner of the team with Gerhard Berger, would disagree with me on that one. His statement, referring to the events of the European GP, that "Only the good drivers reached the finish line today" makes his opinion of Speed and Liuzzi quite clear. When Berger adds to the bad feeling by enthusing over Bourdais and Vettel and then saying, "In Formula One no-one should ever feel one hundred per cent secure," it becomes obvious that the blame for the team's poor performances is being laid squarely on the shoulders of its drivers. No matter that the car has been difficult from the start of the season, reliability has been awful and that Speed, in particular, has not retired through his own fault this year and has been competitive when given decent machinery; no, it's all his fault, according to Tost. Having had enough of the cloud hanging over his head, Scott Speed has finally spoken about the problem. And, in making his feelings clear, he has made himself a prime target for early removal from the STR seat, although he no longer cares. The whole sorry affair does show what has been wrong with STR all along, however: the managers have never been happy with their choice of drivers and this has prevented the team from gelling as it should. A basic rule for any F1 team must be that you do the best with what you've got and, even if you feel that you didn't manage to sign the best drivers in the off-season, you should work with the ones you have and get the best from them. Otherwise you are only handicapping the whole team with your dissatisfaction over something that can't be remedied. Tost's misery is entirely of his own making anyway. Look at the way Speed and Liuzzi have functioned together - they are friends and never say a word against each other. How many team owners must wish that their drivers were as mature and resistant to destructive competition between themselves as these two have been? They have also been loyal to the team, refraining from making disparaging remarks about a chassis that has proved less than hoped for and reliability that has robbed them of decent finishes. As for the STR drivers being fast enough, that is still a debatable issue, since there has been little to compare them with. The best we can do is to look at Red Bull, which runs an identical chassis, and see how they have fared. Perhaps surprisingly, we find that the STR drivers have been very close to the performance of the Red Bull drivers and have even been ahead of one or other of them in some races. That must argue for the quality of Speed and Liuzzi in terms of sheer pace, surely. But we must thank Tost for allowing us to clear up the matter of STR's dearth of results this season. It has not been the drivers, as so many have suspected; it's much more a matter of plain, old-fashioned, bad management. Two words come to mind - oh yes scapegoat. When the team performs what is considered badly, who's first in the firing line? Oh yes, the drivers when as you say it's clearly not their fault. I think if any other drivers that TR is possibly looking at this year had been in the car this season then they would be facing the same scrutiny that Speed and Liuzzi are. Is beyond me, look at some of the departures and you'll see so many names that I'm sure Mr Tost wouldn't mind having in his team. Button, Raikkonen and even this year's golden boy Hamilton. I feel that Speed right now has the right to feel less cared about the outcome of his future in F1, it seems like no matter what he does he can't win. As an F1 driver there is only so much you can do, do your best every race and try to finish ahead of your team mate as often as possible. Which he's done. standings before his luck breaks out. I also remember earlier in the season when Torro Rosso was beating their sister team and Red Bull came under huge pressure. If they were fast enough then, then I doubt they've got slower now, the simple explanation must be that the Red Bulls have improved their car faster than TR, surely? I never really looked at how Speed and Liuzzi have functioned in Torro Rosso this season but from the sounds of things, I don't think TR have much to complain about. I'm sure a lot of teams along the paddock wish their two drivers got on as well and were as loyal to the team. That's the way it looks to me, Pootle. Tost is probably right to feel frustrated at the team's failure to score points as yet but he needs to be much fairer in his assessment of the reasons for that failure. Before the season began, there was a lot of doubt that the STR engineers had enough experience to get the best from Newey's chassis but they have done a reasonable job when compared to Red Bull's struggles in the same area. The fact that they are falling behind RBR now has much to do with STR's brittleness in terms of reliability and, if they can get that right (as RBR seem to be doing), I'm sure the drivers will produce the results too. It's a pity that it doesn't look as if they'll be given the chance. My overall impression is that Tost will never have a winning team. When any employee of any organization feels that their best efforts are ignored while their failings are inflated, when loyalty from employees is not reciprocated by respect and loyalty from management, you will never have a winning organization. I remember a few races ago when Scott Speed said he hoped for some rain to change the dynamics, open things up. Unfortunately, when the rain finally came in this last race, it was a flood instead of an interesting weather twist. Speed and Liuzzi were among the unfortunate drivers to fall victim to the lake that formed on the track, but they weren't the only ones and they had some pretty impressive company. I had hoped Speed would find some opportunities this year to prove himself enough to attract the attention of a better team, alas, this now seems impossible. Through his personal battles with his disease and his battles to stay in the race, we can see Speed is not a quitter but has the determination necessary to be a winner. Too bad he ended up with a losing management. All true, I think, Andrea. And the irony of too much rain arriving in answer to Speed's wish for a wet race is all too evident. I don't suppose that it will make any difference to drivers desperate to get into F1, but it should give pause to Sebastien Bourdais and Vettel to see how their predecessors are being treated. It's all very well thinking that you can prove how good you are once you get in but, if the team never gives you a car that can do the business, your task is made as good as impossible. It's just so silly that Toro Rosso didn't simply get on with the racing. Then they might not have done silly things like the mega-slow pit stop at the Nurburgring. Then Franz wouldn't be having to look for decent drivers at this late juncture of the season. Too true, Alianora. As it happens, today Speed has been testing for the team in Mugello and Tost has said he will definitely drive the car in the Hungarian GP (incidentally, he set a quicker time than Liuzzi's from yesterday - the lad improves even under such stressful circumstances). Presumably that means things have been patched up somehow. I just hope that Scott set some conditions for his return - to continue as things were would be to invite a similar problem just down the line. Really, it doesn't matter what the managers' opinion of the drivers is; they need to encourage and assist rather than criticise and make it so obvious that they're looking elsewhere. Then Speed and Liuzzi just might be able to surprise them with a point or two. 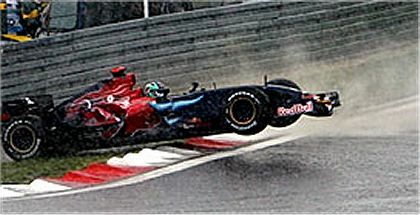 The car is not bad, as demonstrated by Webber and Coulthard at the Nurburg. Hmmm... ...Franz says he'll have Scott back in Hungary, but until Scott confirms he'll turn up there, Toro Rosso may find themselves with no choice in the matter. Evidently things have calmed down a bit, but it may be that Scott attended the test to support a bid to join another team in place of Toro Rosso. Not only did Speed turn up for the test at Mugello, he drove yesterday and today and on both days was quicker than Liuzzi was on Tuesday (admittedly Massa was 3 seconds faster today but what do you expect?). When asked, Tost confirmed to the press that Speed would be driving for the team in Hungary. So what's been going on? I think Dietrich Mateschitz has stepped in, rapped Tost over the knuckles and told him that Scott drives for the rest of the year, like it or not. And Tost, with the possibility of an assault charge that could be made against him, has had to swallow the pill. And I'm prepared to bet that Scott only agreed to get back in the seat on certain conditions. Vettel is there in Mugello but hasn't been in the car. To me that means he won't be driving for them anytime soon and was just having a look at how the team work together (probably to report back to the good Dr Theissen). This might be good for STR in the long run. For a start, I think we'll hear less from the managers about how crap their drivers are and the whole lot of them will be able to get down to actual racing. Given a better environment, I think both Scott and Tonio could begin to make more of an impression in the races. They have the talent, I'm sure, and, strangely, this incident has awoken interest in them - I've seen people in forums make complete U-turns in their opinions on Speed in the last few days. Scott is suddenly "The Man"! A more honest statement from Tost might have been "only those drivers who did not suffer suspension failure coming out of the pits finished today's race." Liuzzi's accident was not the result of driver error. And to judge by the number of cars in the Turn 1 gravel (including 2 Grand Prix winners, no less), I suspect luck played as big a part as judgement in who did and did not go out there.